The situation may arise when you're willing to take a job for which you are clearly overqualified. Here's how to handle it on your resume. You were laid off from your executive job by a company that's now six feet under. You've sent out 800 resumes, done one interview, received zero offers. You find yourself looking lower and lower on the totem pole and occasionally eyeing openings for line managers at the competitor that killed your former employer. If you must apply for a position for which you're clearly overqualified, how do you actually land the job? 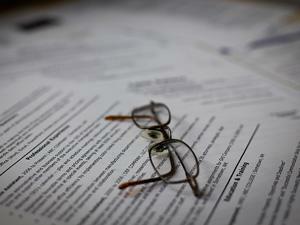 Here's what not to do: Fire off a volley of resumes to human resources departments. "Sending a resume is simply a way to oblivion," says Jeffrey Fox, author of Don't Send a Resume. HR departments must quickly eliminate nearly all of the hundreds of resumes submitted for a single opening. At the first whiff of your extra qualifications, most screeners will stamp "no" on your application. "Resumes are read to be rejected," Fox says. What's the workaround for overqualified candidates? Go directly to the hiring manager to pitch your ability to excel in the open position. You can either call or write, but hold back your resume in the first round of communication with the employer. Once you've found out as much as you can about the company and the position, you've got to imagine how your qualifications mesh perfectly with the job requirements. "If you're overqualified, you need to articulate how a handful of your skills will help that specific employer," says Nick Corcodilos, author of Ask the Headhunter. At least at first, say nothing about higher-level skills that don't pertain to the position at hand. Sooner or later, you'll probably have to send a resume. More than you ever have before, you'll need to customize your one-page presentation of yourself. To de-emphasize those over-the-top elements of your professional background, "you can make some information more sparse, but you've got to be careful about misrepresenting yourself," says Corcodilos. In the interview, if your prospective employer says that your extraordinary qualifications cast doubt on your candidacy, recast your past as an asset to your future at the company. Emphasize that "you're getting somebody with the potential to move up," says Frances Haynes, coauthor with Daniel Porot of 101 Toughest Interview Questions. Employers typically have the following objections to candidates with extra qualifications: You'll get bored quickly; you won't be satisfied with the salary; you'll jump to another company as soon as you get a better offer. "Employers are pretty reticent to hire overqualified people, because they believe when the economy picks up, they'll lose those people," says Haynes. If you raise these issues early in the application process, you risk short-circuiting your candidacy. Instead, see what's on the minds of your interviewers by asking open-ended questions such as these: "What else do you need to hear to be convinced that I'm the best fit for the job? Do you have any questions about my candidacy that I haven't yet had the chance to answer?" Just make sure you've already ferreted out all the tough questions that your work history could possibly raise—and practiced answering them. With all that work experience, it's not exactly easy to convince an employer that you can do the job and won't head for the exit the moment something better comes along. But if your resume positions you in the right way, you have a better chance at getting called for an interview. Could you use some help fine-tuning the details? Get a free resume evaluation today from the experts at Monster's Resume Writing Service. You'll get detailed feedback in two business days, including a review of your resume's appearance and content, and a prediction of a recruiter's first impression. The experts at Monster will help you emphasize the value you'd bring to a company for your best shot at a great new job.